When Matthew Thornton embarked for two years of Peace Corps service in Ethiopia, he was prepared to deliver an educational program in natural resources and conservation to the local people in the community where he was assigned. But he also expected to gain something for himself: an education that can't be found in textbooks. 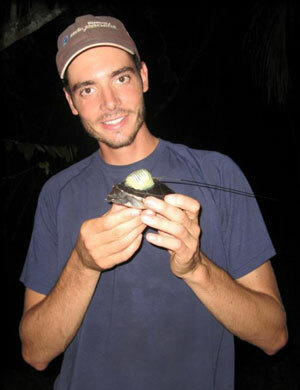 Three years after earning his bachelor's degree through ESF's wildlife science program, the 2009 graduate left for Africa to work as a Peace Corps volunteer in the area of conservation and resource management. In order to learn the language and culture, he was scheduled to first live with a host family. With that initial immersion complete, Thornton was set to be sworn into service and live on his own while providing technical assistance and training in subjects related to the environment. The Honeoye, N.Y., native is one of 133 volunteers currently serving in Ethiopia and one of numerous ESF alumni to have served in the Peace Corps. "Conservation has always been a passion of mine and I believe the majority of future conservation work needs to occur in developing nations... we can help these nations grow in a sustainable manner," Thornton said. He said he hopes to "work alongside and educate the locals, helping at the grassroots level." Thornton credits ESF with helping him obtain the opportunity with the Peace Corps. "Without [my degree] I would not have been able to do anything that I have thus far," he said. "My education at ESF has given me the skills, knowledge, and confidence that will allow me to undertake future projects in my host country." Thornton is prepared to do more learning through practical experience in Ethiopia, a nation of 84 million people on the Horn of Africa. "While on the ground in Ethiopia, I hope to gain a better understanding of issues my host country and its people face," he said. "I hope to gain a different type of education, one that I hope will allow me to better understand the core of many conservation issues and how to effectively approach these matters in the future." Since his graduation from ESF, Thornton has enjoyed traveling while gaining professional experience. He has worked in Arizona with the National Park Service in partnership with the U.S. Air Force to conserve endangered species. He then traveled to Belize and managed a program that worked with villages to study and conserve local wildcat populations. For current ESF students considering the Peace Corps, Thornton offers this advice: "It doesn't hurt to fill out an application. Who knows what they may offer you?"